When planning your motorcycle tours, it can be wise to choose to ride harder on some days more than others. The first time I traveled from Michigan to the western United States on a motorcycle, I took my time. Each day was between 250-350 miles of distance traveled and I didn’t even think about trying to ride farther on a given day. For example, the trip I’m currently on involves a gathering (The Par-Tay) in Washington state near Olympia. I decided that I wanted to ride as much of the west coast as I could given the one week I had to get there. 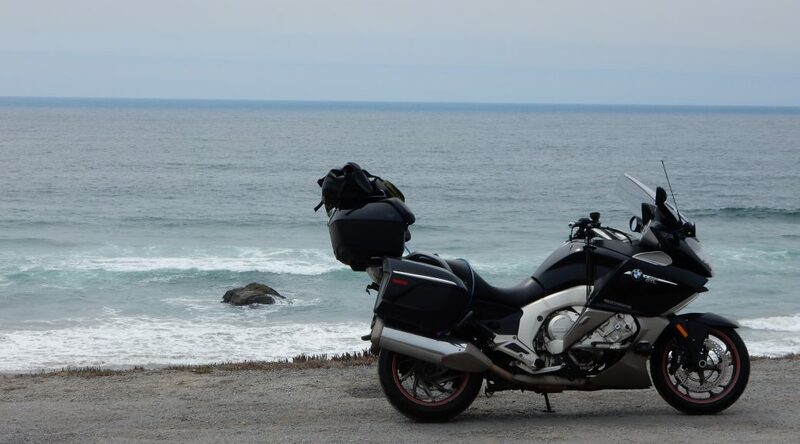 Riding the west coast means (or at least it should mean) lots of California Highway 1 and US101. Both of these roads can be curvy and they both have big changes in elevation. In other words, you do not make time on these roads. Besides, even if you engage in a spirited traversal of these venerable routes, you’re still obligated to stop to take pictures or just gaze at the wonders. You are, after all, on vacation. So, if you’re going to a lot as many days as possible to travel the coast, you have to get there. In my case, I had a bit of a head start because I was starting from Kansas City, Missouri instead of my home in southeastern Michigan. The great expanses of Kansas and eastern Colorado are worth lallygagging through once, but not so much after repeated trips. I’ve been through the Great Plains many times, so my decision was to slab-blast my way across them on interstate highways. While I could certainly spend lots of time exploring the wonderful riding roads in Colorado (there’s a whole two-week trip in itself), that wasn’t the goal for this trip. The good news is that slab blasting through Colorado on I70 west of Denver is one of the more scenic interstate highways in the entire country. Similarly, continuing west on I70 through Utah is not bad either. (Again, Utah can also eat up weeks of riding the good roads in that state). I planned to exit I80 at Salinas, UT and take US50 the rest of the way across Utah and Nevada. Then I could ride over Carson Pass (CA88) into California and visit with friends for a evening before one last dash west to the coast at Bodega Bay. Then the trip would slow down a bit at I took my time for the meat the of this trip: the west coast highways. The next day I blasted through the mountains west of Denver and endured the searing head of western Colorado and the Capitol Reef region of Utah. Just to make things interesting, that juncture of the trip included a storm front where the rain, while visible in the sky, was barely making it to the ground because it was evaporating so quickly. Still, the extra moisture in the air was enough to drop the temperature from over 100ºF to about 73ºF. That was a nice relief. By the time I pulled into Ely, NV, I’d covered 675 miles. Leaving Ely the next morning, I knew that the two long prior days left a slightly shorter day (only 450 miles) to get to my friend’s house, who had volunteered to host me for a night on my way to the coast. While pushing hard to cover ground can involve riding late into the night (one of the reasons I have so much light on the front of the Nightowl), showing up at 10pm at a friend’s house to spend the night isn’t very sociable. It’s much better to arrive in time to chat a bit, have dinner at a normal time (whatever that means to your hosts), and chat some more before it’s time to sleep. Consequently, the decision to ride harder on a given day may be due to the accommodations waiting for you at the end of that day. My last day found me riding a mere 261 miles to get to the end of my first day of coast riding. I was riding the fastest route available to get me to the coast. The I consciously stopped to take some photos and generally meander around a bit to kill some time. Mentally shifting gears from the go-go-go mentality to the sightseeing mentality. Now I have two solid days where I can keep a fairly sane pace and enjoy the vistas and great riding roads of America’s west coast.